Everpure Water Filters and Replacement Cartridge. The same commercial quality that makes Everpure® the overwhelming choice for water filtration in restaurants is also available for your home. Everpure’s exclusive precoat filtration technology combines Micro-Pure® and a unique pleated filter membrane to reduce particles as small as 1/2 micron. This highly engineered design offers the largest filtering surface area, longer filter life and consistent performance. 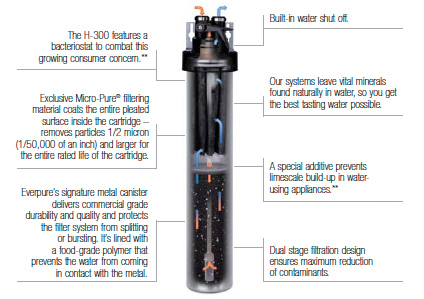 Everpure systems come with a limited lifetime warranty. Reduces chlorine taste and odor and chloramines. Controls even extreme levels of common “off” tastes and odors, including those which are earthy, moldy and fishy. Reduces lead to below the Federal Action Level of 10 ppb. Effectively reduces Volatile Organic Chemicals (VOCs), including Trihalomethanes (THMs). KDF Media provides bacteriostatic control – as tested by KDF® Fluid Treatment, Inc.
Reduces lead to below the Federal Action Level. (H-104). Inhibits limescale build-up in water-using appliances — as tested by Everpure. 1/2 submicron filter system for fountain applications makes beverages taste better and protects equipment from clogging, corrosion and abrasive wear. New and improved MC2 cartridge features Micro-Pure II media with antimicrobial protection to inhibit any potential bacteria growth. For single carbonator dispensers using up to 25 syrup tanks or bag in box per month. Sanitary quick change MC2 cartridge is easy to install and replace. System includes water shut-off, flushing valve, and pressure gauge. Reduces water-related ice machine problems caused by scale build-up from dirt and dissolved minerals. New and improved i2000(2) cartridge features Micro-Pure II media with antimicrobial protection to inhibit any potential bacteria growth. Self-contained scale inhibitor feed keeps equipment running properly and reduces service costs. Features submicron precoat technology to reduce particles as small as 1/2 micron in size. For most cubers up to 750 lbs. per day and most flakers up to 1,500 lbs. per day.